The New York Times lists Singapore as one of the must-go places of 2013, and so, as a lover of lists, I ensured that I found time to drop in and explore the ‘densely populated city-state’ that is gaining recognition for its green credentials and leading the way in vertical farming. Only I had about, oh, forty minutes to explore the place. What snapshots could I get of this city country? We were arriving in from the south-east, up from Australia and my legs were starting to swell after eight hours of inactivity. I circled my feet as I looked down over a palm-fringed coastline and a port dotted in big boat traffic. Singapore. A place that sounded exciting and progressive and buzzy, yet somewhat terrifying to someone like me who craves space and openness and a calm retreat. The airport (and this was all the ground level, stopover sightseeing that I was going to get) had a retro-futuro ambience and an east-west blend of facilities. No way. Not today. These legs of mine need walking. A well-fed, moustached businessman – some airport official – whizzed by me on a segway, into the belly of a grey-brown-orange colour palette. I skirted the sci-fi appeal of the travelators and got my legs marching, all the way to the toilets, where I joined a queue and waited in line for the seat toilets whilst others queue jumped to the squats. I wondered why I made the decision to wait. Familiarity? Previous travels in Asia and South America meant I was fully okay with whatever facilities were on offer, and who sits on public toilet seats in any case? ‘Maybe if I was really desperate’, a middle-aged women said to her friend, and they giggled but stood firmly in line. 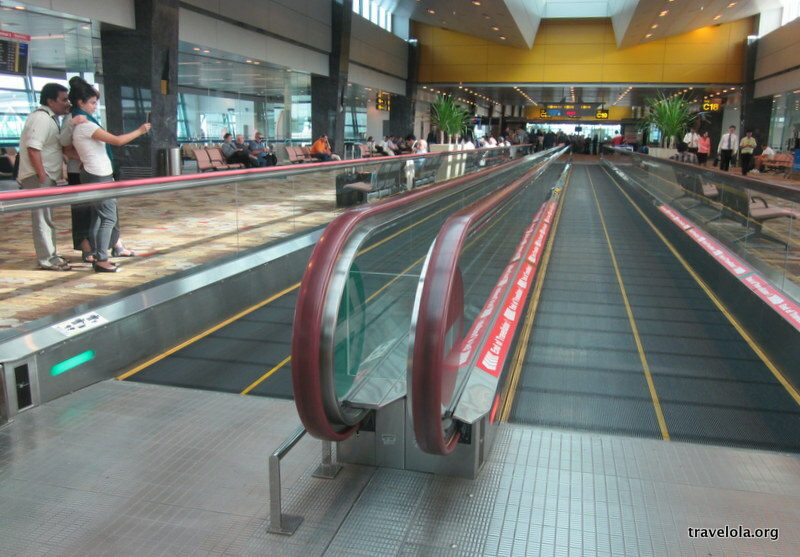 Ducking out of the way of a speeding buggy loaded up with suited types, I did another lap of the travelators, watched a film star from the 2005 indie hit movie, Waiting, get accosted by two fans, and went through an oh-so-stern-and-somewhat-confusing security scan. I counted down my last Singapore seconds to the soundtrack of an MTV assault. There hadn’t been enough time to get out of the airport confines and touch and feel the ‘high-rise buildings, landscaped gardens and heritage-rich precincts’, and I didn’t get to experience the ‘harmonious blend of culture, cuisine, arts and architecture’ of Singapore. But whilst I was pretty damn disappointed with what I’d seen of the place (it was just, well, an airport, much like other airports) I was one journey step closer to London. London, where I anticipated everything would run smoothly: flight landing on time, bags arriving – intact – after three country transfers, my mum waiting with an armful of cuddles.